As a promoter of innovation and good decision making, I am always hesitant of getting too attached to what the icons like Google, Tesla, GE and others are doing. People take ideas from these organisations while forgetting about the culture, the context and the past of these organisations. Trying to copy and paste things that work in a US firm into a South African one is simply not that straightforward. A few months ago I received this URL about an interview with Elon Musk from a friend. I filed under “to do when I have nothing important to do”. My friend raved about this video because it showed that even superheroes like Musk can cry on camera. This did not convince me to make space (!!) for this video. So this morning, while attending to some administrative things, I watched this youtube video of an interview with Musk. I liked it very much. He talks about the difficulties of promoting an idea that is not supported by people that he admired. Yes, he gets a bit moist, but that is certainly not the main reason to watch this clip. Watching the SpaceX rocket return safely to the landing pad was just breathtaking! So here it is. Take a look. For me, the moral of the story is this. Don’t think that the current thought leaders will always appreciate your genius, your progress or your ideas. Challenging the Status Quo is tough. Even with lots of money it takes time, probably much longer than we all think. I hope that you can today also decide to push harder despite not always receiving the recognition and the admiration that you believe you deserve! Last year I started writing a series about Instigating Innovation. To make it easier for regular and irregular readers the previous posts are summarized here. The first post in the series was published in June 2015. I chose “instigating” because it has a more positive ring to it than provocation or incitement. While it is a noun with mainly a positive tone, it is a bit more aggressive than support, enable or encourage or even stimulating. I have been referred to in my past as an instigator of change so I thought this was a good idea. Bear in mind that the content of this series is aimed at meso-level industry supporting institutions and programmes as well as enterprises themselves. 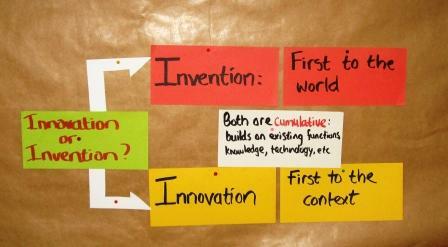 Then I wrote two posts (innovation culture and cultural change) about innovation culture in enterprises. When I teach about innovation I am always struck by how executives think that by creating a function in an enterprise strategic problems will be solved. This is especially true for innovation, but it also applies to other management areas such as strategy, operations and marketing. The last post of 2015 in the series looked at the four universal functions that management must attend to in order to institutionalize innovation. I have planned a further five posts in this series, but have already started writing this up as a working paper. Thank you for the constructive feedback from Ulrich, Frank, Goran, Larry, Liza and the “likes” from many of my regular readers! Please let me know which ideas you have already implemented or tried in your organization! I would like to continue the “Instigating Innovation” series (see opening post here, where to start and the post about culture here). The idea behind this series is that I explain innovation management concepts that can be used by both enterprises and technology transfer and industry support institutions. To recapitulate: I believe that many industries are struggling to modernise because their supporting institutions use completely different frameworks to manage innovation (or perhaps the supporting institutions make their choices as randomly as enterprises do). One of the first concepts that a tech transfer institute or industry support organisation should transfer to enterprises is “how to manage innovation and technology”. Just because there is an engineer or an MBA/PhD in a company does not guarantee effective or creative management of innovation and technology. Today I shall focus on the four broad functions that must be managed strategically in every enterprise and supporting institution. Even if someone in the organisation has the job title of Innovation Manager or Technology Manager, these functions should still be visible throughout the organisation. In other words, this is not somebody’s job, but it helps if somebody coordinates these activities.